I've posted this recipe before. But it deserves repeating because it's SO GOOD! OK, to be fair, I tried the chocolate chip cookies in two brand-new, well-known (and will remain unnamed) vegan cookbooks over the weekend. And honestly? They were OK. I know all those authors are far, far more experienced cooks than I, their recipes have been tested by hundreds of people, they probably know FAR BETTER how to make the "perfect" cookie, but "perfect" is in the eye (and tastebuds) of each individual - this is still THE BEST Chocolate Chip Cookie Recipe that I've run across. And I know I'm plenty biased since my daughter created this recipe JUST FOR ME from several non-vegan ones, figuring out and tweaking the vegan substitutions all on her own. But we all love this recipe. Everyone I know loves this recipe. Everyone. Even cookie-haters (yes, there ARE some out there). I have no illusions that I will ever publish a cookbook. My recipes are not top secret. They are not filled with spelt, high in fiber or nutritious with whole grains. But they are vegan, and they are yummy. The "Toll-House" kind of cookies you grew up with. Here you go. Bake some, sit back and watch "American Idol". Enjoy. 6.) Drop by small well rounded teaspoonfuls (actually less than a teaspoon, more like 3/4 tsp) onto ungreased cookie sheet. Bake for 8 - 10 min. until lightly golden. Watch the time, it depends on the pan. 7.) Let cool on the pan 5- 6 min., just until set enough to remove to wire rack. they looks ultra tasty! thanks for share. I'm just sitting here drooling, I need to make these. Thanks! This looks like a great recipe for the simple, chewy cookies we all loved as a kid. I totally agree with you about the spelt flour and exotics not belonging in my cookies. They should be simple, easy, unhealthy, and freaking delicious! I'm not a chocolate lover (I know, I know) but I like the fact that the cookies have pieces of chocolate which makes them proper chocolate chop cookies. Oooh... I have been looking for a good vegan chocolate chip cookie recipe for ages. They look amazing. Thank you! I am soooo craving chocolate chip cookies. I was even looking through some cookbooks this morning to decide which recipe to make. 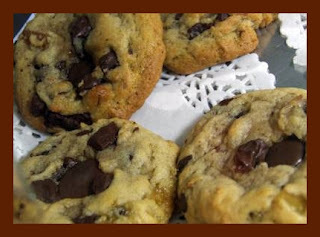 Isn't it freaky that I looked you up and there is a drool-worthy picture of chocolate chip cookies right on your blog? I don't have coconut oil or Ener-G in the house or I'd be printing this off and hitting the kitchen. I will be giving these a try though. Thanks for sharing. Looks and sounds delicious... lately, I've been thinking about using coconut oil in chocolate chip cookies... hehe.. seems like your daughter is a step ahead of me! I admit that your cookies look more tempting than all other CC Cookies I have seen recently. Such a sweet story, and sweet treat to go with it. No lie, this recipe truly IS amazing and one of the BEST. I've made it several times, and the cookies are always quickly devoured by anyone who comes within sniffing distance! My omni fiance LOVES them. :) Thanks again for sharing this recipe with your readers! Love these!! However, I had to add more liquid since the dough was a bit dry. I doubled the soy milk and halved the amount of chocolate chips. They still came out great. I love that these are vegan and lower in fat than the traditional toll house. Thank you Ms. Tofu Mom and Miss Olivia "sprout"! HipFlyGirl... WOW! I'm perplexed... Now I'm wondering about the liquid ratio in these, though different flours do absorb moisture faster than others... ah well. Glad the modification worked!